Bhutan is located on the southern slopes of the eastern Himalayas, landlocked between the Tibet Autonomous Region to the north and the Indian states of Sikkim, West Bengal, Assam, and Arunachal Pradesh to the west and south. It is believed that the name Bhutan is derived from the Sanskrti Bhotant meaning " The End of Tibet" or from Bhutan meaning "high land". Historically the Bhutanese have referred to their country as Druk Yul "Land of the thunder Dragon". Bhutanese refer to themselves as Drukpa people. Upon your arrival at Paro airport, you will meet our representative/ driver, who will take you to your pre-booked Hotel - Taj Tashi, Thimphu. Rest of the day is free for you to explore this beautiful town on your own. Overnight stay in Thimphu. Thimphu, the capital town of Bhutan is one of the smallest capitals in the world. For the most part of its history, Bhutan has tried consciously to save its culture from the influences of the western world. It is not that modernity has not reached this region, but it is being introduced in a phased and balanced manner that is unheard of at any place in the world. All these make Thimphu and other parts of the country a unique destination. 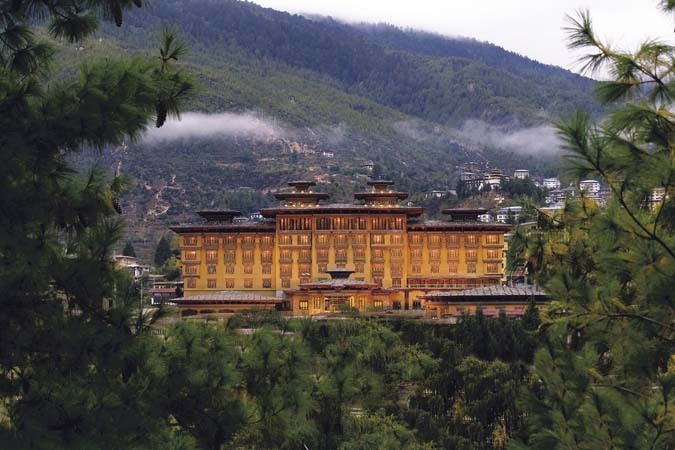 Today, enjoy a full day sightseeing tour of Thimphu. Visit Kuensel Phodrang (Buddha Statue) a place for refreshing with a huge statue of Buddha on the top of the Kuensel Phodrang, National Memorial Chorten (Monument) & Folk Heritage Museum. Afternoon visit Sangaygang View Point, Changangkha Monastery, Takin Preserve Centre, the national animal of Bhutan can be seen here. 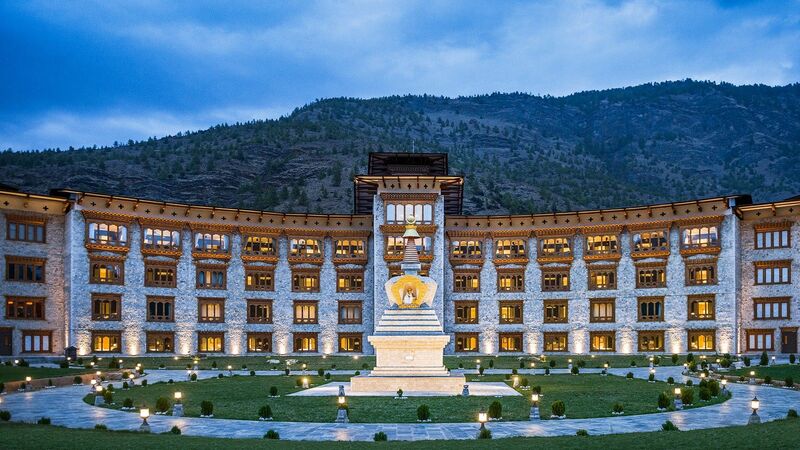 Later, visit Tashi Chuu Dzong, also known as "Fortress of the Glorious Religion", the main secretariat building which houses the throne room of his majesty the king of Bhutan. Later, return to Taj Tashi, Thimphu for the overnight stay. After breakfast, drive to Paro. On the way visit the Tamchog Lhakhang – It is situated between Thimphu and Paro and it was built in the 13th century by Thangthong Gyalpo. He is also known as the Iron bridge builder. Situated on a hilltop, we have to cross an ancient style bridge to reach the temple. 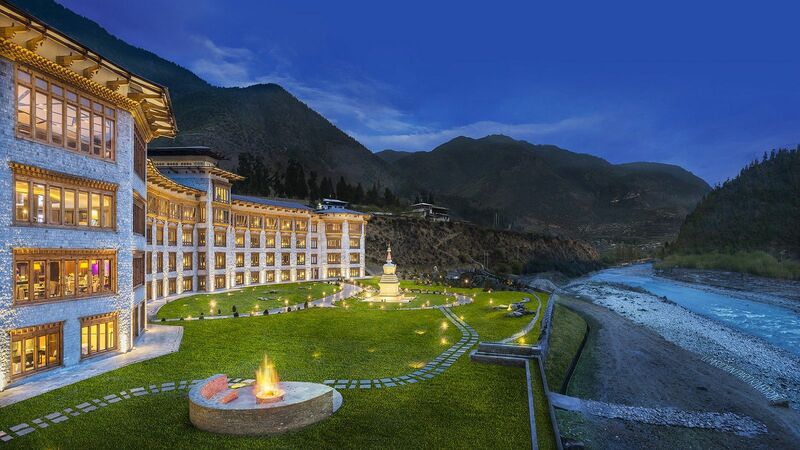 Upon arrival in Paro, check in at your pre-booked hotel - Le Meridien Paro Riverfront. Afternoon visit Ta Dzong - National Museum with an excellent collection of arts, relics, religious thangkha, etc. Rinpung Dzong - Meaning "fortress of the heap of jewels". The Dzong now serves as the administrative and judicial seat of Paro. 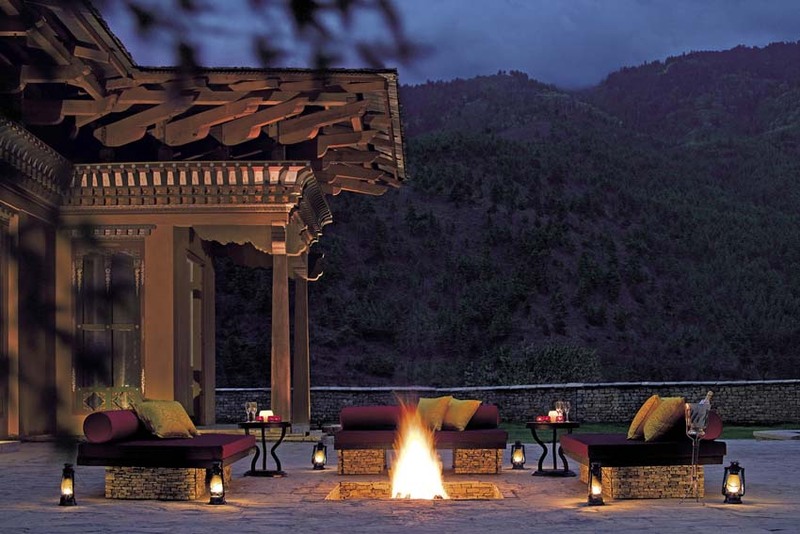 Later, return to Le Meridien Paro Riverfront for the overnight stay. After breakfast, visit Durugyel Dzong or the Fort of Drupka Victory, set on a knoll with a spectacular view of the surrounding valley the ruins of this fort, which once protected against Tibetan invasions, provides a wonderful architectural insight to the structure of forts in Bhutan. Drukgyel is also the starting point to many of Bhutan’s most famous trekking routes. This is a historical site from the ramparts of which the Bhutanese repelled the Tibetan invaders. Taktsang Monastery, 'Tiger's Nest' situated 3000 feet above the valley floor & the most famous Bhutanese monasteries. 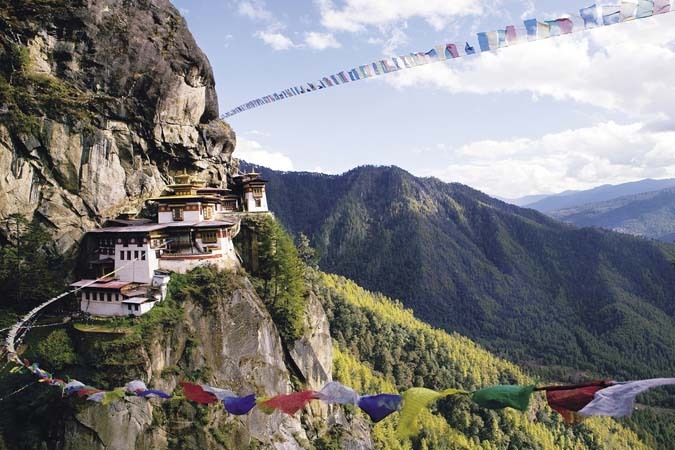 It is said that Guru Rinpoche arrived here on the back of a tigress and meditated at this monastery hence it is called "Tiger's Nest". The excursion to the monastery takes about 5 hours for a round trip. 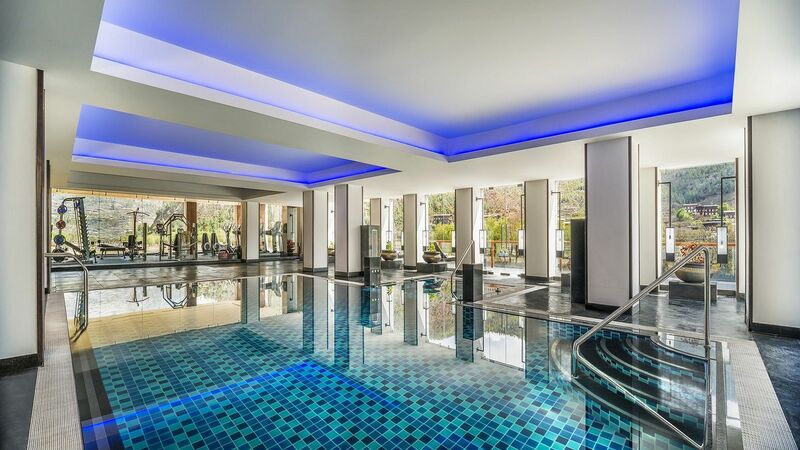 Later, return to Le Meridien Paro Riverfront for the overnight stay. After breakfast in the hotel, bid adieu to this beautiful country. Our driver/representative will drop you to the airport to board your flight back home/for your onward journey. Expenses of personal nature like laundry, phone calls etc. 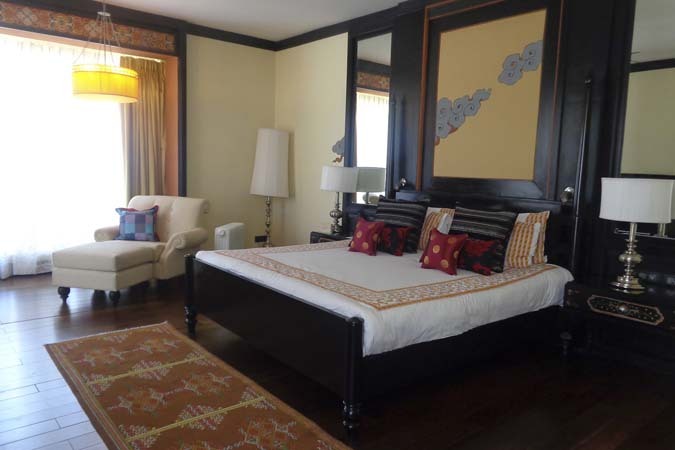 Price mentioned is on per person basis for two persons travelling together and sharing the same room. The above package rate is not valid during national holidays, festivals & long weekends. In case of non-availability in the listed hotels, alternate accommodation of similar standard will be booked (subject to guest's consent). It is mandatory for all guests to carry Valid Passport/Voter ID Card IN ORIGINAL. No other photo ID’s are accepted in Bhutan.